The name 'Lemon Blueberry Bread' says it all. This lovely tea bread is bursting with juicy sweet blueberries and brushing on a hot lemony glaze just as it comes out of the oven, not only infuses the bread with a nice citrus flavor but it also makes the bread tender and moist. It is really a pound cake, which makes it perfect any time of the day. Lemons have the ability to bring out the best in any fruit they are paired with. A lot of recipes call for lemon zest (the outer yellow skin) as this is where the lemon hides most of its flavor. For this very reason I try to buy organic lemons for some commercially grown lemons are sprayed with insecticides. But, either way, it is good practice to always wash your lemons thoroughly, that means with soap and water, before using. 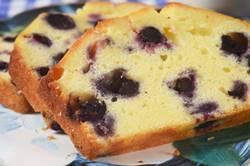 Wild blueberries are excellent in this quick bread as are their cultivated cousins. Blueberries are rich in antioxidants, high in fiber, high in potassium, and low in sodium. Because blueberries are now sold in plastic containers, check the underside of the container for any wet spots or staining. I usually open the container to make sure that the blueberries are a nice dark blue color with a dusty white bloom, and that they are firm, plump, and fragrant. The white bloom is the blueberry's natural protection against the sun and is a sign of freshness. When folding fresh blueberries into any batter use a light hand so they don't crush and stain the whole batter blue. Tossing the blueberries in a little flour helps to prevent them from falling to the bottom of the bread during baking. Try to use small blueberries as this also to prevent this from happening. Lemon Blueberry Bread Recipe: Preheat oven to 350 degrees F (180 degrees C) and place the oven rack in the center of the oven. Butter (or spray with a non stick vegetable spray) the bottom and sides of a loaf pan (9 x 5 x 3 inch) (23 x 13 x 8 cm). In the bowl of your electric mixer, or with a hand mixer, beat the butter until softened (about 1 minute). Add the sugar and continue to beat until light and fluffy (2-3 minutes). Add the eggs, one at a time, beating well after each addition. Scrape down the sides of the bowl as needed. Beat in the vanilla extract. With the mixer on low, add the flour mixture (in three additions) and milk (in two additions) alternately, starting and ending with the flour. Mix only until combined. Gently fold in the blueberries. Scrape the batter into the prepared pan and bake for about 55 to 65 minutes, or until the bread is golden brown and a toothpick inserted in the center comes out clean. Lemon Glaze: In a small microwaveable bowl, stir the sugar with the lemon juice. Place in the microwave for about 20 seconds or just until sugar has dissolved. When the bread is done, remove from oven and place on a wire rack. Pierce the top of the hot loaf with a wooden skewer or toothpick and then brush with the hot lemon glaze. Cool the loaf in the pan for about 30 minutes then remove from pan and let cool completely on a wire rack. This bread is best served on the day it is made, but it can be stored several days or frozen.